Last month I met with Jackie for her Old Towne Orange Portrait Session. We chose this location because of it’s urban, yet vintage environment. It was the perfect setting for Jackie’s portrait session. Every couple of years or so Jackie comes to me to have her portraits updated for her personal and professional (She’s an incredible makeup artist) sites. This year she wanted to show off more of her feminine side, while still incorporating some of her nerdy passions. She arrived in an adorable summer dress that was reminiscent of Marylin Monroe’s iconic Seven Year Itch look along with her vintage style shoes. She looked absolutely stunning! One of the props she brought along was her Indiana Jones fedora. It fit in perfectly with our vintage setting. After we worked our way through the immediate Old Towne Orange area, we stopped by a local park to switch things up a bit. That’s when Jackie brought out her serious model moves. Rawr! Towards the end of our session she brought out one more set of props: COMICS! 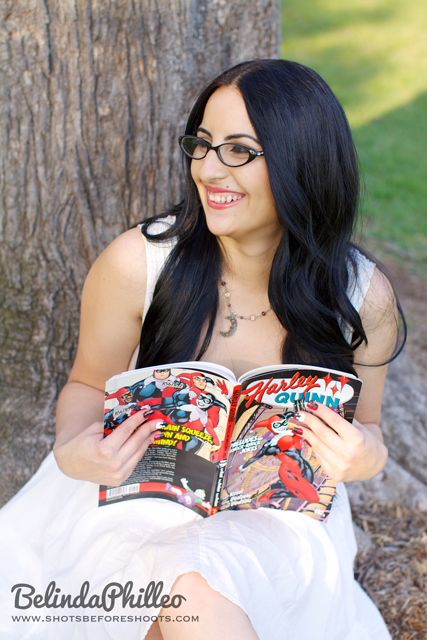 Jackie loves her comic books so she decided to make them a part of her session. She even had her nails painted to match one of her favorites, Harley Quinn. Want to schedule your own Orange County Portrait Session? Stop by the contact page to set up a complimentary consultation!